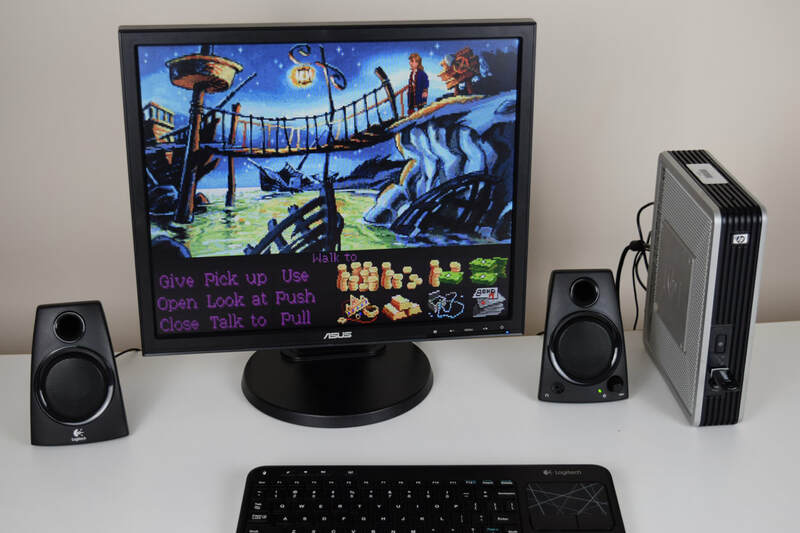 The HP t5720 is a Thin Client PC that works great as a Retro Gaming PC. It comes with a 1GHz AMD Geode NX 1500 CPU, which is basically an Athlon XP with unlocked multiplier and extremely low voltage and power consumption. It takes DDR SODIMM RAM with up to 1GB (there is a single RAM slot) and has an internal 44-Pin IDE header with a Flash Module attached for storage. You can connect all sorts of storage devices here, I ended up using a SD to IDE converter for most of my projects. The machine has the usual PS/2, USB, Audio, Ethernet, Serial and Parallel ports and also an internal PCI slot. ​The PCI slot can't used with the standard unit, a expansion bay / case attachment is required. But the unit can be modified by cutting a slit, routing a PCI extension cable through it and mounting a PCI card onto the machine. The PCI slot is picky and doesn't work with many cards, so a bit of trial and error is needed to find something that is compatible. The BIOS is extremely limited in terms of options, but the machine can boot from most USB devices. It can also use a standard USB flash drive in MS-DOS as a hard drive. I used a 2GB USB Flash Drive for this purpose and makes copying DOS games onto the machine easy. This works with FAT and FAT32, so can also be used to copy Windows 98 SE installations files onto the machine. For partitioning, formatting and making the internal storage bootable I used a standard USB Floppy Drive with great success. All in all this is a Thin Client I can highly recommend to anyone wanting to try one out for Retro PC Gaming. It runs MS-DOS, Windows 98 SE, Windows XP and Linux.